As the true all-mountain width in the Alp Tracks line, the 94 is a daily touring machine. With a crazy light yet robust construction, the AT series of skis are sure to gain some converts to the Swiss ski movement. The Alp Tracks 94 is part of a limited hand-made ski series whose build-process involves squeezing fiber layers around a Karuba wood core. The result is an impressive weight-to-performance level. The 94mm underfoot ski has a lightly rockered tip and a tail the releases easily, making it easy to ski in soft and mixed conditions. The variable thickness edges cut into harder snow and the ABS sidewalls add impressive hold. 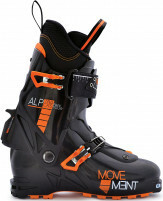 The Movement Alp Tracks 94 is a great one-ski quiver for North American ranges. ABS Shock Absorbing walls underfoot smooth rough patches. Unique VA-Tech tips have rubber & glass to absorb vibration. Bindings are secured with a Double Plate Reinforcement area. Forest-friendly certifications were achieved with the wood cores. Tour Edges vary in thickness along the ski, a hard trick to pull off. Hard P-Tex 5000 is impact resistance and skis well even waxless. Update 2018/19 - Just a graphics change. Bottom Line Best one-ski quiver? I have used these skis about a dozen times now, skinning up at the resort (Mt Crested Butte) and alpine touring in the local backcountry. For reference I am a 62 yr old nordic skier/racer and am "re-introducing" myself to alpine skiing after about fifteen years of doing strictly nordic. I am 68" and 155lbs., and I have these skis paired with Superlight 2.0s and Alien boots. Obviously I am trying to keep the weight down, but I have no interest in skim racing. No huge ambition to try and ski everything with these skis either - I use them in soft conditions. I don't consider myself a great skier so it is a good thing these skis seem to ski themselves, so far in multiple types of powder whether embedded deep in or floating along the top of very firm windblown. All I have to do is think about turning through the gladed areas and it just happens. Bottom line I think is that they make me a better skier and I am having a blast with them. These skis are fantastic. I've put them through the ringer this year, and they're pretty much my desert island ski. For reference, I like light skis that punch above their weight class (Atomic Ultimate 78, Salomon X-Alp, Movement Alp Track LT 106 are the rest of the quiver). Though I have both lighter skis and fatter skis, these are my go to for everyday touring and ski mountaineering. I'm 5'11" 155 lbs and ski the 177cm. The ski is stupid light. Unlike other light skis its not chattery or floppy or noodly or weak. It feels very balanced and neutral, and stiff enough to hold an edge on steeper stuff without becoming harsh. Playful and easy to turn would be good ways to describe them. They are NOT a ski for terrible snow. I tried them at the resort a few times and only in piked crud do you notice tha their weight can be a downside. Still, they're more than enough width for breakable crust and other inevitable backcountry scenarios. Pair these with a pair of lightweight bindings like the superlite 2.0 and be happy. Can you describe the difference between the DPS Cassiar 95 Alchemist Ski and Alp Tracks LT 94 and offer conclusion/ opinion? Hi Michael, very different skis! If you're charging at the resort, the Alchemist is a decent option for all-mountain skiing. Very damp and durable. For backcountry skiing, the AT 94 is a light ski that will get you a lot further, and also be a ton of fun on the way down. I'm wondering how these ski compared to the Zero G 95? I currently have the ZG95 in a 178 and while I find them totally acceptable, I'm not in love with them. I'd like a touch softer and "looser" while still being capable of hard, spring mountaineering. Hi Kevin, the Alp Tracks 94 is definitely a little softer and it's an easier turning ski with a fair amount of sidecut. Depending on your flavor of hard, spring mountaineering it could be a very good choice, but the tendency to want to be turning can also be a detriment at times. Hi Paul, we are expecting them on Monday! Does anyone know where the mounting point is on these and the 84's and which one of the two is more stiff? Hey DK-! In terms of basic profile, shaping, and stiffness, the 84 and 94 are pretty dang similar. There are some subtle differences that make the 94 a better all around ski with a soft snow bias and the 84 a better all around light 'n fast ski with a hard snow bias (still a riot in powder though). Not sure exactly which size you're looking for the mounting location on, so I'll assume the middlest length, the 177cm. Both skis, the 84 and 94 in a 177cm length use a mounting location that's 98cm from the tip, about 9.5cm back from true center. There are a handful of manufacturers that we routinely urge to mount slightly forward/back from their mounting location and boot choice factors into that a little bit, but for the most part the mounting locations on the Alp Tracks line are perfect. The AT 94's replaced my Movement Logic 167cm skis (87 width), which I loved dearly and had no problem at all "staying in the front seat" or making tight turns. I use Sportiva Womens Sparkle boots and Dynafit Speed Mtn bindings. I am giving up on the Alps Tracks and would like your advice on a replacement, superlight, not too expensive (no DPS), ski, probably in the 87-88 width. I own Hagan 75 skis so 84 seems a bit narrow for the quiver. All the descriptions of your skis in the 84-88 range seem pretty similar to me. I need help on what would be a better ski --- different length/surface area? Smaller radius? Softer flex? Semi rocker instead of full rocker? Hi Hannah, there are several things that could be going on with your setup. It could be a quick fix. Looks like you didn't get them from us so we don't have the details. Any chance you could e-mail us your phone number so we can talk through it? Just noticed that the whole Alp Tracks line went on sale recently -- does this mean that the "limited" run is coming to an end or being phased out of the shop? Or just a spring discount on a ski that you'll be stocking 2018/19? I love the AT 84 so much I'm considering other widths, wouldn't want to get burned by indecision. Thanks! TSB- We will be carrying these skis next year too. But take advantage of the spring sales now. I'm comparing the Alp Tracks 89 and 94 and found the attached test. Would you agree with differences for the flex and rocker? I’m wondering what’s the effect on the performance and which ski would be the best for me. I’m 145lbs at 5”80 and maybe the softer ski would be better for me. Also the bigger rocker appears al little more comfortable to ski. I’m looking for an ski which can handle all conditions at ski mountaineering and floats weel at powder snow. Hi Dominik, these things are pretty subjective, but for the most part I agree with the data in the image you've posted. My personal opinion is that the Alp Tracks 94 is slightly more versatile for the powder conditions you mention given it's wider underfoot dimension, straighter side cut, and tail geometry. At your size and weight, you'll probably be happiest on the 169cm length. How might this ski compare/contrast with a Voile V6? It seems a bit lighter, any other thoughts you might have heard? There is not as much internet-based info on the Alp Tracks LT 94 as some other skis? Hey Andrew! Both skis are fantastic so you can't really lose here! The V6 is a killer ski but because of the flex pattern, shape, rocker profile, etc, it's definitely a soft snow oriented ski that would pair well with a two or four buckle boot (1,000-1,400g). Voile has a special place in my heart because their headquarters are 20 minutes from our headquarters and they are really tough to not have a great time on. The Alp Tracks line is definitely built for the light 'n fast backcountry skiers and ski mountaineers though. They handle that way, they pair with those boots really well, the surface area to weight ratio screams efficiency, the flex pattern wants to be skied from the center of the ski like how lightweight boots drive skis, and the bases are rock solid compared to most other skis in this weight category so it all depends on what you're looking for out of your skis. Is this the 2017-18 model. I thought it was on sale yesterday? Skins? Will you be carrying Movement products this winter? Hi Andre, we are definitely still carrying Movement! We had a bit of mixed inventory, I just verified and updated the listing to clarify the season. Only the color changed for 2017/18. Happy to extend the sale price to you on the newer color if you'd like due to the mixing (skins are also on sale, yes). Thanks for the feedback on the boots. I have spent about 40 days now on these skis in every condition; I love them! Watch. Awesome video Randy, thanks for sharing! What does this ski weigh in a 183 cm length? How compared to the Zero G? The AT94 in a 183cm weighs 1230g/ski. At the moment I don't have an equivalently sized ZeroG 95 to measure against, so instead I weighed the AT94 and ZeroG 95 in a 169cm and 171cm, respectively, just to get a close comparison and frame of reference. Tip to tail cord length on the AT94 169 and ZeroG 95 171 are almost identical actually, so the direct comparison is even closer than I had originally thought, which is great news! The AT94 169cm weighs 1125g/ski and the ZeroG 95 171cm weighs 1215g/ski. That's only a 90g difference per ski between the two, but I would guess in the longer lengths around 183cm, you'd be looking at over 100g, possibly 120g per ski. I have had these skis for about a month now and have put about 50,000 ft of vert climbing (and just as much skiing) on them so far. I am 5’9” and 170 pds, and I went with the 169s. I paired them with the Superlites 2.0 and the Spitfire 2.0s. My primary use is for ski mountaineering. I am very impressed with everything about this ski. They are light, nimble and playful. They are really responsive and turn on a dime in the tightest places. I have skied every condition that the mountain can throw at me, sometimes all in a single day. I was surprised at how well they handle in icy cruddy conditions, and when you get any kind of soft snow (whether powder, heavy wet, windblown, etc.) they make you look like a pro! I love them on steeps. They are so light on my back, I forget they are there, and I’ve had days where they were on my back for over 8 hours. At first I had buyer’s remorse for getting such a short length. I have never skied anything under 185. But now I’m happy that I went short. I have ice climbed up narrow gullies (not much wider than one person) with them on my back in places that I would have never taken my previous set-up. I still ski as fast and hard on them as I ever did on longer skis, and they handle it fine (not that I ski that hard in the backcountry; they ski comfortably up to 35mph and start to feel wobbly after that). They did take some getting used to at first. It was like learning to ski again, but I quickly adapted. They are, now, my favorite ski. Hi Randy, I'm debating between the Alp Tracks 94 vs. the 84 and as I'm reading your review I'm leaning towards 94 more. Regarding the size, I'm debating between 177 and 169 and usually I would pick 177 without thinking since I'm used to rocker skis north of 187, but I think these skis have more of a subtle rocker and more effective edge. As I read your review, I'm wondering how come you went with the 169 and not the 177? If you have tried the 84's and/or have any feedback on them, would be great to know. Thank you. Hi DK, I haven't tried the 84s, but as far as width goes I am very pleased with the 94s and wouldn't want to go any narrower. I went with the 169 as kind of an experiment. I usually ski around 185. I was looking to shave weight and ease of movement on the ascent, knowing that the kind of terrain I'd be hitting would include a lot of carrying on my back and looking for a tight turning ski on the downhill. I kind of regret not going one size longer. I love them on the uphill and in tight places, but the short length greatly effects the downhill stability, especially when trying to push the speed. However, most of the time I am fine with the length. I have to make a conscious effort to stay centered on them as they don't function well in the back seat, and it seems like they quickly throw me there. It was a bit of a learning curve. I'm not sure if the back seat thing is an issue with the ski or with the short length. I highly recommend these skis, but I'd suggest going longer rather than shorter. That's my two cents!